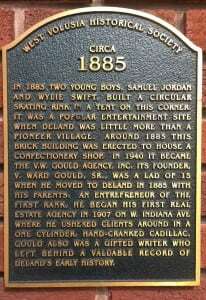 DeLand was originally founded in 1876 by Henry DeLand. As a historic city, DeLand is proud of its rich heritage and unique history. V.W. Gould Agency, Inc. has been located in downtown DeLand since 1907, originally located on Indiana Avenue. The agency moved to it’s current location on the corner of Rich Ave. and Woodland Blvd. in 1940. DeLand is the county seat of Volusia County.